Chicken & Garbanzo Soup - - Canning Homemade! Tonight when I got home from a long day at work I was extremely happy to open the pantry and find a few jars for my hubby and I to heat up for dinner. Every time I open the door to my "under the stairs" pantry, straight ahead of me in my eyesight, is this amazing jar of Chicken and Garbanzo bean soup. I did it before the holidays but it really has not been cold enough to enjoy a soup. Tonight in addition to a busy day a storm is passing over our coastal paradise and the temperature has dropped. I opened the jar and heated it through, topped both my soup and my hubby's Chili Con Carne with shredded mozzarella cheese and diced red onion. I did a loaf of Roasted Garlic 4 ingredient bread to go with these two easy dishes. I roasted some garlic and added it to the dough at the very end of the rise just before I baked it! The Chicken Garbanzo soup was great with tender chicken and the garbanzos were perfectly cooked. I added a bit of jalapeno and onions also to the jar to round out some great flavor. For this recipe I had garbanzo beans left over from the pound that I cooked and froze them for hummus later. Also you may need less stock depending on how tightly you fill your jars. Enjoy! Preparation: Cut the chicken by removing the skin and extra fat and then cut into cubes. Chop the onion and jalapenos and set aside. Cooking: Put the beans in a big pot and cover with water. Bring beans to a quick boil and turn off the heat. Let the beans sit for an hour. Cover the expanded beans with more water and cook them for 30 minutes. Try to keep them at a simmer. Boiling the beans at this point may split them. Filling the jars: On a dishtowel place your hot jars in a semi circle leaving room for your pot -that has your recipe. Add a 1/2 cup of the pre-cooked garbanzos to the bottom of each jar using your slotted spoon and the jar funnel. Add equal portions of the onions, jalapenos, and a dash of salt and pepper to each jar next. Next layer the chicken cubes filling to 3/4 of the way then add the broth/stock liquid into the jars leaving 1” headspace. Remove air bubbles and refill to the proper headspace if necessary. Taking a clean papertowel and wipe the rims of the jars with white vinegar removing any food particles that would interfere with a good seal. Using your magic wand extract the lids from the hot water and place them on the now cleaned rims. Add your rings to the tops of each of the jars and turn to seal just "finger tight". 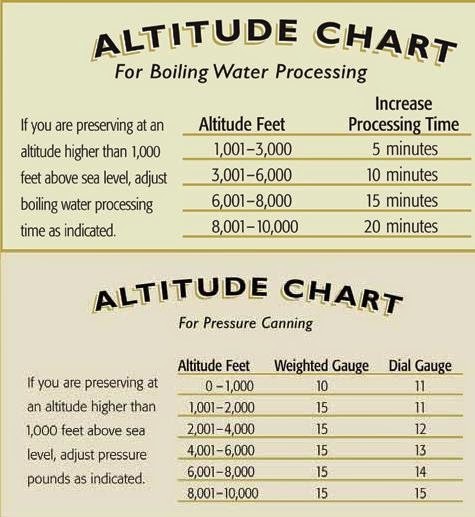 Processing: Make sure your canning water has come to a simmer and place the jars in the pressure canner. Lock the lid and turn up the heat bring the canner to a boil. Vent steam for 10 minutes, then close the vent by adding the weighted gauge or pressure regulator (for dial gauge canner). Process pints for 75 minutes at 10 lbs of pressure (11 lbs for dial gauge canner) and quarts at 90 minutes. When complete turn off the heat and let pressure return to zero naturally. Wait two minutes longer and open vent. Remove canner lid. Wait 10 minutes then remove jars and place on dishtowel in a place that they will sit overnight to cool. Do not touch or move them till the next morning.